Sic. 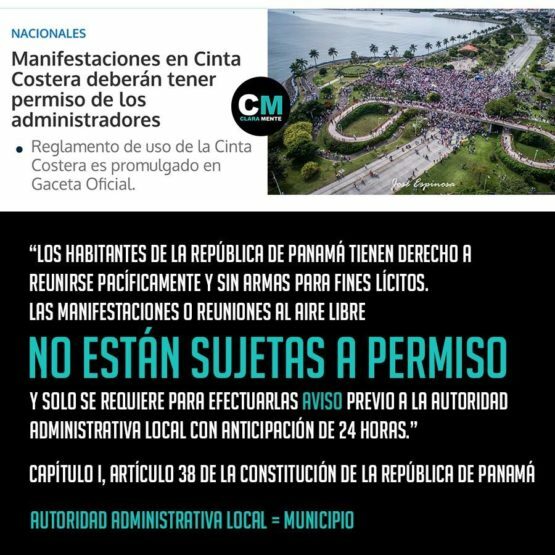 Eight days after a massive anti-corruption protest on the Cinta Costera, the Varela administration decreed a ban on that sort of thing except for causes which it approves. In the hours after the massive January 9 anti-corruption protest on the Cinta Costera, against the outward sign of a sea change there were also some subtle and not-so-subtle undercurrents. Just a coincidence? That afternoon anti-corruption campaigner Miguel Antonio Bernal, this reporter and a number of other activists and bloggers lost Internet connectivity for a few hours. For some of us the problems have continued off and on. Not a coincidence: As soon as stories about the protest started to be posted on the online editions of the corporate mainstream media, call centers swung into action with talking points concentrating on how unpatriotic it was to protest against corruption on The Day of The Martyrs; calling the protesters “corrupt;” and bringing in the word “seditious,” which had not been heard in Panamanian public discourse since Noriega times. Almost all of this was pseudonymous, as the organized comment campaigns below news stories tend to be. A relatively small breakaway march from the main protest, which made its way past the Hotel Miramar where the president lives, had people jumping and shouting “There, there, there’s the thief!” Ricardo Martinelli’s media empire, the acquisition of which is the subject of criminal investigations but which has not been confiscated, played it all up as a big boost for the former president. If there may have been a few Martinelistas in the crowd there weren’t that many. None of the recognized leaders of Cambio Democratico party were present. Perhaps the jailed ex-president’s braggadocio served Varela well, by giving his supporters someone less popular than himself at whom to point fingers. We can’t really know because the Electoral Tribunal has effectively banned the publication of opinion polls, saying that this would distort the May 2019 elections. The cabinet warned of measures to be taken against those who protested and slammed the news media for covering the events. On January 17 the administration published its measures to be taken, in the form of Executive Decree 281, a long document purportedly about mundane administrative matters with respect to the Cinta Costera. It includes things like a dress code for licensed vendors that bans flip flops, and smoking is now prohibited on the Cinta Costera. Buried in the decree, any political or religious activity on the Cinta Costera has to get permission from the government — but no permits will be issued for anything but recreational, cultural, family or sporting events. The government will have the discretion to require a bond in any amount for any event on the Cinta Costera. The SPI presidential guards are in charge of enforcing this. 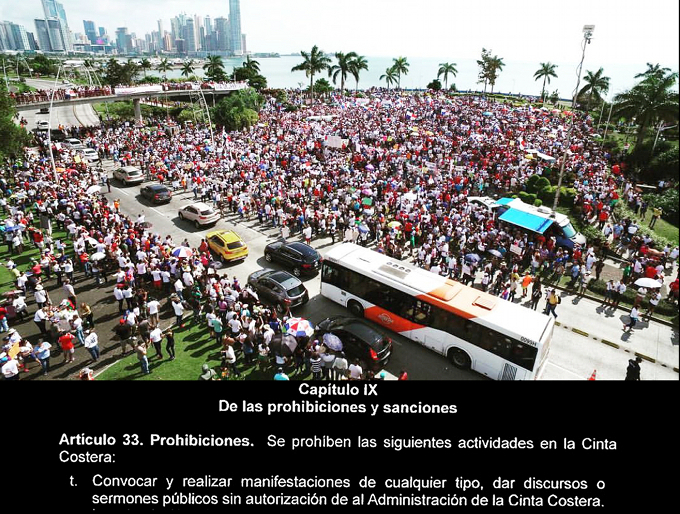 Article 38 of the Panamanian constitution, however, provides that peaceful open air demonstrations and meetings are legal and require no permit, provided that the municipal government is notified 24 hours in advance. Varela ran for office in 2014 promising a constitutional convention to change the current document, which is a hand-me-down from the dictatorship. However, he backtracked on that because, he said, he could not be sure of controlling such a convention. There is an impending test of Varela’s control, whether he can get the National Assembly to approve his nominees to be magistrates to the Supreme Court. Odds are that he can’t, and if a deal is made with dissidents from the Cambio Democratico and PRD legislative caucuses, the quid pro quo is likely to be so sordid that the protest movement would gather extra force. Varela is afraid of a constitutional crisis, yet appears to be creating one. 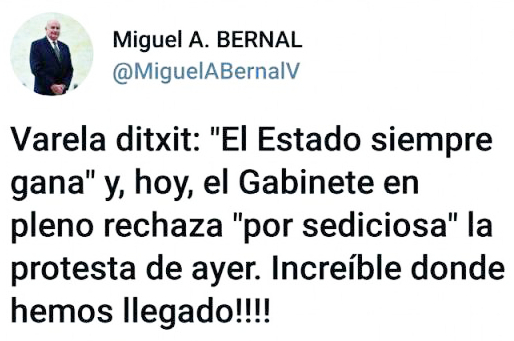 On January 10 Miguel Antonio Bernal, one of the individuals behind the protest movement, reacted to the Varela camp’s declarations. ClaraMENTE, a small alternative media group that’s one of the organizations behind the protest, reacted to the January 17 decree.